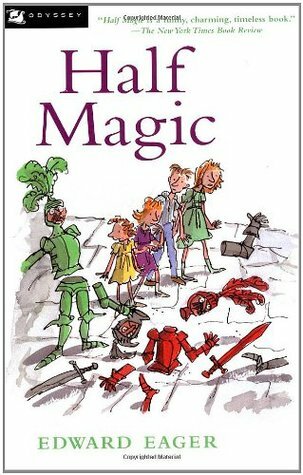 I really enjoyed the children’s book, Half Magic, which was recommended to me by my husband. He read this book when he was younger and loved it; thought I would like it too! He was right! Half Magic is a fantastic, easy read! I loved that this book has everything in it for younger children including: magic, time travel, and sibling difficulties. It was great to read about children really liking to read books and working together to solve their problems. There are many literary references throughout the book too, which is awesome! Each of the four siblings has their own chapter in which they discus what they wish for and its outcome. I liked this simple organization of the book for younger readers and also that the children learn something from each of their experiences. It was also interesting to see the overall outcome of their adventures! This children’s book is also quite funny, especially when you get to hear a half talking cat. Hilarious! It also isn’t too violent for a children’s book. There is only one questionable part in the book in which some knights get chopped into pieces (eventually put back together again), but it isn’t explained in too much detail. However, I think this part could have easily been replaced by something more appropriate. A couple other things I enjoyed about Half Magic were that the characters felt real to me, though it did take a little while to be able to tell them all apart, and the amount of detail in such a short book was perfect! I could easily picture where they went and what they were experiencing. What didn’t I like about this book? Absolutely nothing! It was a fun, interesting, and an exciting read, and I can’t wait to read the other books in this series. This would be a perfect book to read aloud to children 8 or older, or a way to get them into reading books!